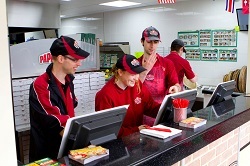 An exciting opportunity has arisen to join one of the largest pizza franchises in the world. Located in a prime high street location in Kings Heath, Birmingham, this Papa John’s store is on the market due to the current franchisee selling to focus on a new Papa John’s venture in Europe. This established business was the first Papa John’s store in the Birmingham area. The household count within the Trade Zone of Kings Heath allows for a further store in that Area. Papa John’s is currently incentivising existing Franchise Owners to assist that development. Interested parties should initially contact the Franchisee and once a price has been agreed then contact Business Development who will take you through the Company process to acquire the store. New Applicants will have to be fully vetted by Papa John’s.